That’s cool. I didn’t know about those workarounds. It looks like “More Fields” is listed as broken at the moment, probably because of the recent upgrade to WP 2.9. Hopefully the plugin gets fixed pronto for all those WordPress users that are using it. I spit all the fields back out at the page within The Loop. Hovering the ‘What’s this’ shows the tooltip text I defined when I set up the new fields in Magic Fields. It’s really slick! You can even change the type of fields, their default values, what category the post defaults to and which fields are required in order to publish. <?php echo " Estimator: ",$Estimator,"Addenda: ",$NumAdd,"
Eric, thanks for linking that image to the post interface. Yep, it seems like Magic fields could really handle a lot of these types of problems. I still lean towards thinking that that type of functionality should be part of WordPress itself, not a plug-in that might break with each WP upgrade. Hey Eric, just checked out your site. Your artwork over at http://www.ericthomasbostrom.com is intense! Heythanks, I appreciate it! In my opinion, the flexibility of WP is what is intense! I’m now doing some crazier stuff. After I built that posting interface with Magic fields, I spread that data out as necessary. I’m using category-N.php and single-N.php (with a functions add_filter) to have special category and single post templates for just one part of the site I’m working on. My next step is going to be an implementation of Role-scoper to limit the access to that special category and custom write panel for just one user, so the one user can only post to that category (much like your add-new-musician example). Once I’m done defining post access I can set up an interface that will let my subcontractors auto-reg for level 0 accounts, so they can view content (like plan sheets and specification manuals) that I want to hide from other general contractors or plan rooms. That looks great. I haven’t tried Magic-Fields yet, but as you point out w/your examples, the fields are called in the template files so you can have them show for specific page types (templates). But, on the wp-admin add/edit post page, the Magic-Fields form always appears, regardless of the page template you choose, right? Or not? Nope, If I’m in the regular ‘Post’ write panel I get the default WP layout (or whatever I’ve customized). All of the magic fields entry and customization appear if I click on the ‘Plans’ write panel. Just for the record, Magic Fields is a fork of Flutter, the former attempting to correct some shortcomings of the latter. For very large sites, this is not the way to go, since the ‘custom fields’ are stored in the database in a very inefficient way. In my experience, however, this is only a practical problem for internationally-oriented sites with very large amounts of content (I’d say Amazon or eBay, but that’s probably stretching it a bit). It’s not an issue if you’ve got a ‘mere’ 50.000 posts and, say 10.000 visitors a day. Inefficiency is, of course, inefficiency, and it would be a huge plus if WordPress accomodated a bit more flexibility in using custom fields. Depending on your needs, Pods is the better, more scaleable option. Pods allows you to create a whole separate content system inside of WordPress, separate db tables ‘n’ all. And that’s also one of its limitations. If your ‘custom’ content needs to be heavily integrated with your posts, this is difficult to do in a user-friendly way. For example, if you look at http://www.tail-out.com/, the banners at the top of the page and the videos in the left column are ‘pods’, whereas the extra information in the left column on http://www.tail-out.com/archives/50-demon-games.html is stored in custom fields. For me, a combination of both approaches usually works best. Totally agree! I am just working on an new website, it need to be multilingual & have different field on the main page. I use WPML for the multilingual part and am using WP 3.0. And tried Magic Fields & Flutter but they do not work with WPML! The thing I am not able to do is simply create 4 fields under the main page admin where the owner can add different content to each fields. 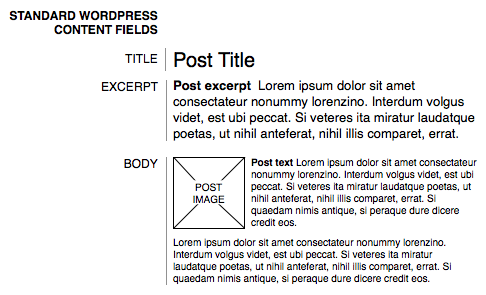 If only WordPress had Template Variables like MODx CMS or MODx CMS had a blogging system like WordPress…. I fully agree WP needs to have build in support for multiple content areas / blocks. It’s a fundamental component of a CMS in my mind. Sure WP has some great features like custom post types and custom fields, but sometimes you just want plain old editable areas. Page.ly MultiEdit definitely is a good start, it adds tab in the editor for each region which is awesome, but the Multiple Content Blocks plugin (http://wordpress.org/extend/plugins/multiple-content-blocks/) seems simpler and more stable. Hopefully finally someone with WordPress will maybe take one of the plugins and built it into the core. 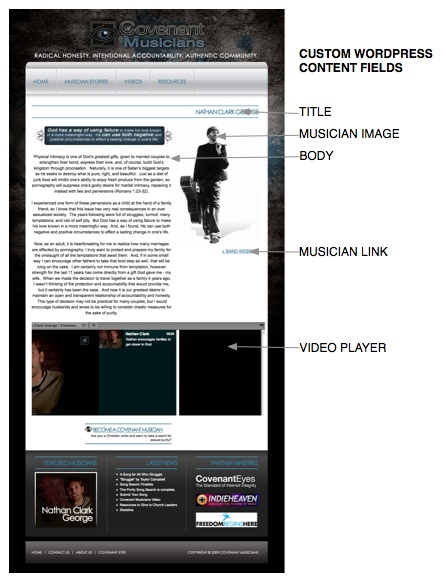 You can’t have to a true, robust CMS without content areas. Let’s keep the push for this going! Keep making noise about it and hopefully folks will listen.